In this post we will consider minimax rational approximations used for computation of modified Bessel functions of the second kind – . We will follow our usual workflow – we study properties of the existing methods and then propose our original approximations optimized for computations with double precision. We try to keep the post brief and stick to results. Detailed description of our methodology can be found in previous reports of the series: K0(x), I0(x) and I1(x). All software libraries relying on rational approximations for computing use (1) and (2) with small variations in coefficients of polynomials and . 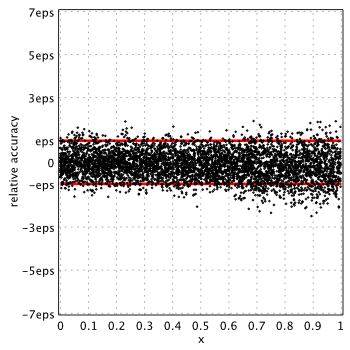 Relative accuracy shown below is measured in terms of machine epsilon ( eps = 2-52 ˜ 2.22e-16) against “true” values of the function computed in quadruple precision by Maple. 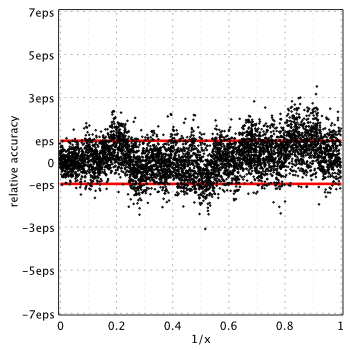 Red lines show natural limits for relative error we expect for double precision computations. Boost and SPECFUN use the same coefficients from original report of Blair & Russon. Strangely enough Numerical Recipes delivers good accuracy for , , whereas it shows very poor performance for all other functions – , and . 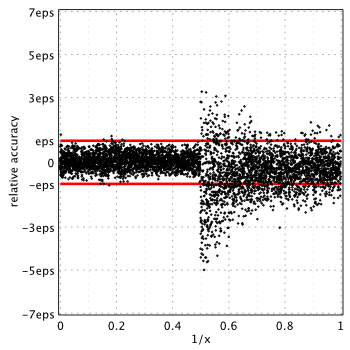 Similar to K0(x), MATLAB provides the lowest accuracy for compared to all other libraries. Relative error is up to 10.14eps near the . GSL and MATLAB use Chebyshev expansion for computations and apparently both suffer from similar issues (incorrectly rounded Chebyshev coefficients as GSL source code revealed). This form reflects behavior of for small arguments well and showed good results in our previous study. For large arguments we use the same formula as in (2). 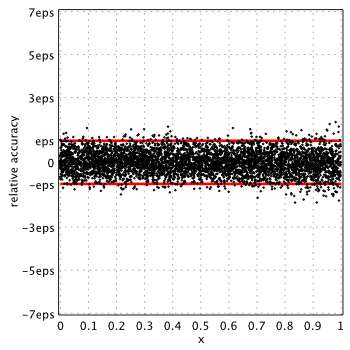 Instead of using pure approximation error (usually computed in extended precision when rounding errors are ignored), we use additional criteria to find the optimal approximations. Highest priority is assigned to the actual accuracy delivered by schema in double precision. In other words, we take into account conditioning of the approximation in double precision. Maximum error is 1.63eps for small arguments and 2.25eps for . We have derived new rational approximations for the modified Bessel function of the second kind – . On the contrary to existing methods we minimize the actual error delivered by approximation in double precision. 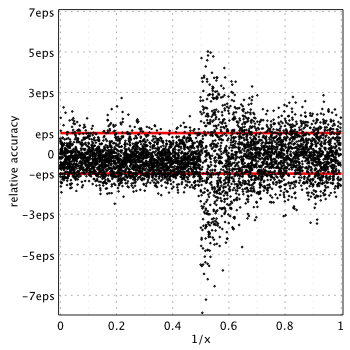 Proposed methods provide highest relative accuracy among all publicly available approximations (published and/or implemented in software). 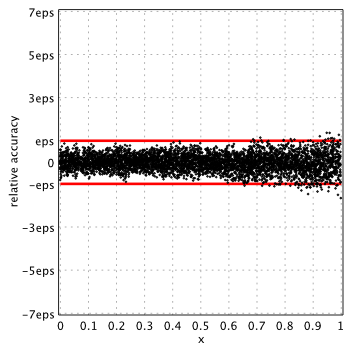 MATLAB suffers from accuracy loss near zero and should be avoided if accuracy is of high priority. Russon A.E., Blair J.M., Rational function minimax approximations for the modified Bessel functions and , AECL-3461, Chalk River Nuclear Laboratories, Chalk River, Ontario, October 1969. Boost – free peer-reviewed portable C++ source libraries. Version 1.59.0. Boost: Modified Bessel function of the second kind. Cody W.J., Algorithm 715: SPECFUN – A Portable FORTRAN Package of Special Function Routines and Test Drivers, ACM Transactions on Mathematical Software, Volume 19, Number 1, March 1993, pages 22-32. 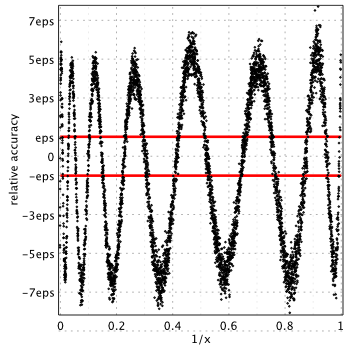 SPECFUN: Modified Bessel function of the second kind. I thought you would like to know that I’ve just implemented something similar to this for Boost.Math. However it’s actually possible to do a little better, consider (5) for a moment, it turns out that K1(x)x^1/2 e^x is approximately constant for x > 1, and therefore there’s an old trick we can use – to replace P22/Q2 by C+R(x) where C is an arbitrary constant chosen to be the approximate value of the function over the range in question (truncated to an exact binary value), and R(x) is a rational approximation optimised for low *absolute* error compared to C. Now as long as the error with which we evaluate R(x) is small compared to C, we effectively “erase” the error when we perform the addition. 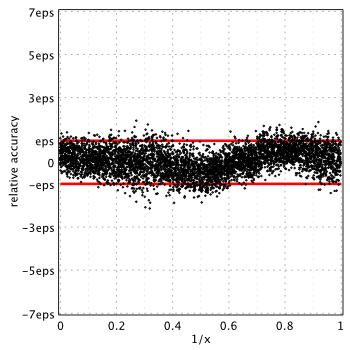 Of course we may still round incorrectly as a result of the erroneous bits from R(x), so the error is slightly more than 0.5ulp, but we should be close. Add in 0.5ulp from the other 2 terms and we should achieve an overall maximum error just slightly more than 1.5ulp ~ 1.5eps. Similar arguments apply to(4) where your P5 and P8 are being added to terms > 1, so these need only be optimised for low absolute error, similarly for K0. Both functions also extend to 128-bit precision fairly easily using these techniques BTW. Thank you for the wealth of information and congratulations on results! I am sure it will be useful for many people as well. The next step would be to reduce error to < eps and provide correctly rounded values. IEEE standard requires this for elementary functions, special functions is the natural next step. In this case approximations should be based on simple polynomials with coefficients representable exactly as machine numbers, with lookup tables for worst cases (to resolve table maker dilemma), etc. Quite boring and tedious work, far from actual math :).